Woven Plastic Barricade Tape is extra-durable non-pressure sensitive adhesive product, which is made of Polypropylene monofilament yarn with a filling of polyethylene monofilament. 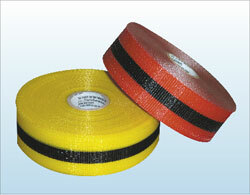 It is much more durable and stronger than traditional polyethylene film type of barricade tape due to its configuration. The tape is available in striped pattern, 20175BY is black stripe on yellow woven plastic film, and 20175BR is black stripe on red woven plastic film. It is designed for using in the construction sites, road work, chemical and industrial plants, any potentially hazardous areas and maintain crowd control.